Things I Learned @ Toy Fair 2014 #5: The Presidential Game Rules! | "DESTROY ALL FANBOYS!" Things I Learned @ Toy Fair 2014 #5: The Presidential Game Rules! Playing Politics CAN Indeed Be FUN! (Who knew?!) 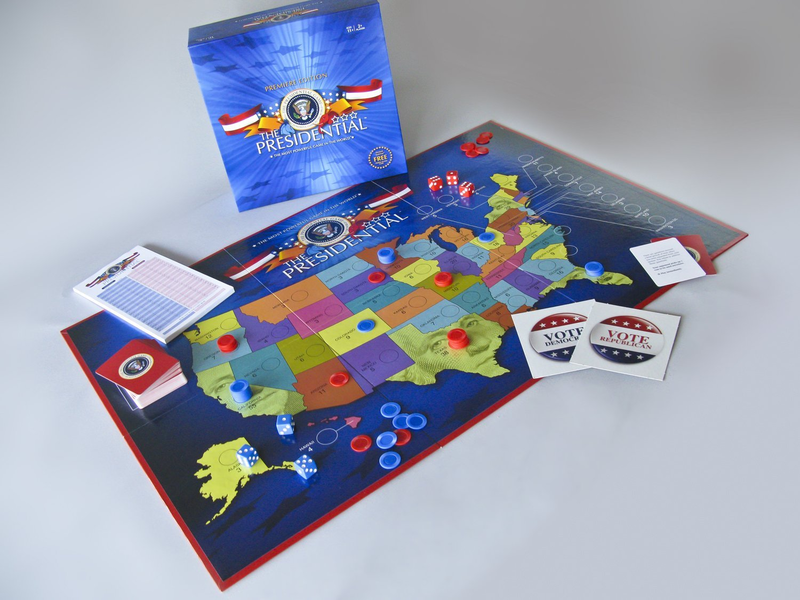 While it’s designed to teach kids about our rugged (but sometimes shaky) presidential election process, The Presidential Game makes for an excellent primer for those political junkies from the book-fed constant reader to the lazy cable news-head who believes every one-sided argument (and it’s ALWAYS an argument) that screeches from his or her speakers. Created by Regina Glocker, the game aims to teach kids and young adults about the electoral college and how it works while delivering a fast paced and fun experience in the process. The cool thing here is Glocker had no previous game creating experience at all, but you know what happens when an idea seed gets planted, nurtured by like-minded companions and grows into a healthy tree with useful fruit, right? The game is a mix of modern politically strategics by players trying to gain 270 or more electoral votes as they campaign across America by means of rolling dice, drawing cards and playing consequences based on those cards. Blue and Red chips designate Democratic or Republican electoral votes and where you place them as you play is also a factor. Spend them all in one state or across a few your candidate may not have a chance at traditionally? It’s all up to you. Those cards add a nice bit of humor to the game, as scandals, past party votes and gaffes that may come back to bite all get dealt up at some point. The game even comes with 40 blank cards that players who aren’t on either side can use to make their own topics and such up, omitting cards from the main deck they feel are inappropriate for their kids (or themselves). While this bit of DIY also add the chance some users will simply rewrite history as they see fit, it’s a great touch that shows Glocker was thinking of as broad an audience as possible. There’s also an optional online component here in the form of an in-game code included that allows access to a nifty webmap calculator that keeps the game honest (provided the person entering the numbers isn’t a sneaky partisan pest!). This part is fun because it gives the gameplay and election night feel to it as the weeks pass (each turn represents a week’s time) and the numbers for each party shrink or grow. You can certainly play this without the webmap, but with it, someone’s bound to get in some extra gripe time if their party is losing and the turn count gets close to the end. I got a few laughs at Toy Fair playing against Glocker and immediately saw the potential for this game to go huge once enough people saw how clever it’s all come together. Then again, given that it was a successful Kickstarter project back in 2012, I’d say those who backed it already know how awesome this game is. In playing the game with a few friends recently, it was clear that adults get a LOT more boisterous when the subject of politics is the subject of a breezy board game. I’ll note that this may not the game you want to bust out with adult beverages, as things can get more fun, but exceptionally funky when some on extreme edges with a bit too much booze in them get a wee bit too cranky when they draw a card that sends their vote count down (and that card is too close to a scandal or other incident that makes their guy or gal look bad). No physical fights broke out, but there was some stiff-lipped crossed arm action for a few minutes when most of the other players were cracking up at one player’s unlucky series of draws from the card pile. “It’s RIGGED!”… No, it’s not. Of course, that person wanted to introduce his own cards into the game before it was completed, but we all considered that gaming the system, so it wasn’t allowed. This entry was posted in DAF, Updates and tagged 2014, Board Games, BUY This Game, Family Games, Games, Kids, Politics, The Presidential Game, Toy Fair 2014 by geelw. Bookmark the permalink.